While medical research may prove beneficial, there are some test that are worse than useless, Dr. Meurs DNA test is one. She raced to get that poorly researched test to market, Some breeders made decisions based on what she was claiming was credible, and it turned out that if a breeder relied upon her test, they would be going in the wrong direction. A Holter result is even more misleading in the context of choosing breeding pairs. Your current DPCA Public Education Coordinator is documented as the author of a proposal for health needs (dated June 11 & 15 resp. ), and while the presentation is in the style of B. Bailey, the content is pure K. Davieds. By this document's date - we can say that it is very likely a product of Dr. Davieds who served on Judith A. Brown's committee (Medical Research Evaluation Committee) at that time under the administration of then President, Jan v Wormer. Ask the above named participants why were the covert attempts to conceal the source of this document used? UPDATE: (former) President Jeff Helsdon & the Board have created a position especially for K. Davieds, Health Coordinator. FACT : They maintain networks of all the animal rights groups, including HSUS to accomplish their agenda. They do so without benefit of law enforcement agencies. In fact their operations include conducting covert sting operations and infiltrating people's home who are suspected of hoarding animals. The piece describes self-appointed animal rights people, K. Davieds et al, protesting an alleged Amish puppy mill, which later mysteriously burnt down. Ruled accidental, it was thought to have started with a kerosene heater used to warm the kennel's whelping facility. Because Dogwood Kennels was uninsured, an official investigation wasn't conducted. Now, Schmucker says he wishes the fire had been fully investigated. "The activist people have actually burned down places in Missouri," he said. 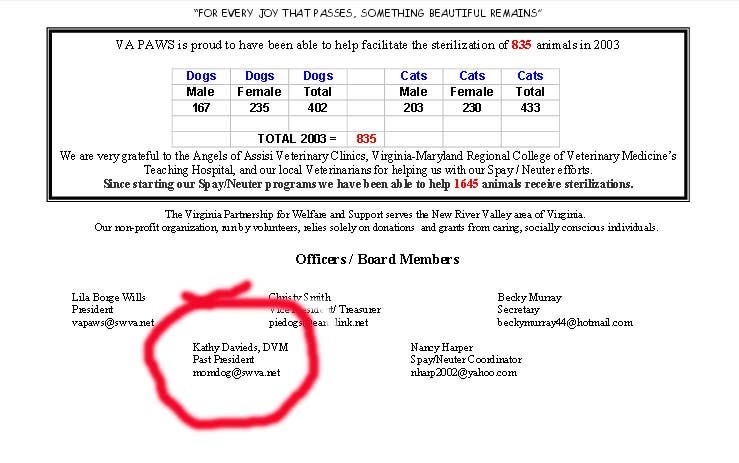 "Manifesto for Radical Abolitionism: Total Liberation By Any Means Necessary"
VA PAWS says "the cause of animal abuse can be traced back to irresponsible breeding, irresponsible ownership and inadequate animal welfare legislation and enforcement." FACT : All of those radical groups support the BANNING of cropping and docking. FACT : Kathy publicly and on-line LIED to the membership concerning Joanna Walker's position on cropping to further her own position. FACT : Kathy exhibits and promotes UNCROPPED Dobermans.  Why is the "new" BOD taking the DPCA in this radical direction and what can we do about it? Read their approved motions since taking office in October. All can be found on DPCA's website- "members only" section, and in part here as well? 2013-2015 Bonnie Bailey failed in her run for the board but has been retained as P.E.C. by (former)President Jeff Helsdon & the Board. Bonnie Bailey - to Chair this committee and committee members, Susan Rochester and Kristine Sklenak, DVM. The Chair, Bonnie Bailey is closely associated with Kathy Davieds and co-owns with her. Exhibiting uncropped dobermans does NOT support the standard. Uncropped dogs are LESS than ideal because they deviate from the described ideal Doberman. Bonnie Bailey has been put on the fast track to the Board room - . Can you see the trend of animal rights people permeating the DPCA? and an uncropped blue. While this appears to be still a young dog- a reader might easily assume that blues are not cropped and that this is acceptable? A consistant message is absolutely critical to the universal understanding of the Doberman Pinscher standard. To present anything other than the ideal in public information is deleterious to the breed. Why has Adlercrest, (a.k.a. Linda M. Calamia) been allowed to continue as a DPCA member when her and her husband, Phillip have openly rejected the DPCA standard in violation of the DPCA rules - for over 28 years!!!??? Please ask your Board for an explaination.  Why did the DPCA Board of Directors fold on the Albino /Top Twenty issue and allow Tony DiNardo to go running to AKC on an internal parent club issue that should have been resolved within the Top Twenty Committee ????  Why did Jeff Brucker appoint Sheila DiNardo to Chair the Albino Committee ???  Why was Kathy Davieds appointed Chair of the Crop/Dock Committee ????  Why was Bonnie Bailey put in as Public Education Coordinator? RETAINED THRU 2014 !?  Why was Dr. K. Davieds moved from the C/D Chair and given a new position?